World Music has been making significant inroads in popularity among American audience ever since Paul Simon's 1986 album Graceland introduced a lot of people to sounds from Africa. These days, the World Music charts are being dominated by Celtic influence, but the African sounds that Simon helped to popularize continue to be a hotbed of creative activity. And in keeping with the general trend of multi-cultural cross-pollenization, many African artists are coming out with fascinating blends of styles that are anything but strictly traditional. For the past decade or so, Paris has been a hotbed of World Music, with many African artists from countries like Zaire, Senegal, Mali and Nigeria coming together with Western influences to record and perform. Some of the best known are Youssou N'Dour and Baaba Maal from Senegal and King Sunny Ade from Nigeria, all of whom have absorbed Western influences in their music while still maintaining traditional ingredients. One of the most creative and downright interesting of the African artists who have achieved a measure of popularity in the West is Salif Keita, who has just released a new recording entitled Folon... The Past. Keita's biography is as remarkable as his music. In fact, he was the subject of a BBC documentary a few years back. A native of Mali, Keita was born into a prominent royal family who are decendents of the 13th Century king Sunjiata Keita who founded the Mandinka Empire in West Africa in 1240. But Salif Keita was born an albino in a land where those with the condition were ostracized and even sacrificed in an earlier day. Rejected by his father, Keita was turned onto the streets as a teenager, where he resorted to music and his family's tradition of the griot or storyteller to make a living. In the Malian capital of Bamako, Keita began to make a name for himself, first as a part of a group called the Rail Band, then as Zaire's Les Ambassadeurs, who achieved fame even as far away as America. Like other prominent African musicians at the time, Keita settled in Paris, and began recording there. His first US release, Soro from 1987 was memorable and influential recording that combined Western pop influences with the plaintive vocal style that is a West African tradition. The album featured a mixture of traditional instruments such as the Malian kora and percussion with synthesizers and electric guitars. In recent years, Keita has been travelling extensively in Europe and America and absorbing influences everywhere. And for the first time, Keita toured throughout Africa, discovering and assimilating South African sounds, especially the mbqanga style which is quite distinct from West African traditional or contemporary music. In fact, Keita had the lyrics for one of the tunes he wrote for this album translated into Zulu. And there are plenty of Western pop influences on Folon... The Past, from a funky horn section to jazzy chord changes to New Age synthesizers and sonic ambiences that provide transitions between the songs. There's also a reggae styled piece and some almost folky sounding acoustic tracks. The result is a fascinating record that is at times danceable, at other times strikingly beautiful and at others vaguely exotic. The producer for most of the album is Wally Badarou, another interesting figure -- from Benin in West Africa, Badarou has become a figure on the pop dance scene, having worked with artists like Grace Jones. A few years ago, Badarou also released a particularly fine new age synthesizer album. So one can hear such influences on Keita's new release. Also prominent is keyboard man Jean-Philippe Rykiel who was a prominent part of Keita's 1987 release Soro, and who has been somewhat missed on subsequent Keita albums. The rest of the large group backing Keita includes a mix of French and African players, including a horn section and a traditional African-sounding vocal chorus. 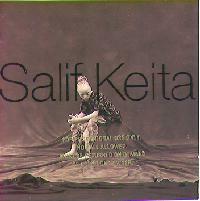 Salif Keita's newest album Folon... The Past is a fine example of the eclecticism of World Music. It's not just music from one exotic part of the world, but a mixture of influences from Keita's native Mali to American funk to Caribbean reggae. And it's all very tastefully handled, thanks to the fine work of producer Wally Badarou. Keita's distinctive vocals may not be to the immediate liking of people who spend their time listening to the likes of Michael Bolton, but his style is instantly recognizable and conveys a range of emotions that transcends the language barrier, and can often be striking in beauty. Sonically, the album is quite commendable. The mix, which was done in England, is first-rate with lots of subtle audio treatments such as the ambiences between tracks, and skillful blending of percussion sounds. The result is one of the finest African influenced World Music albums of 1995, and a CD whose appeal could extend beyond the usual World Music audience.